A dear friend of mine recently posted this picture. I was immediately taken with it. Doesn’t it sum up the human condition so succinctly? 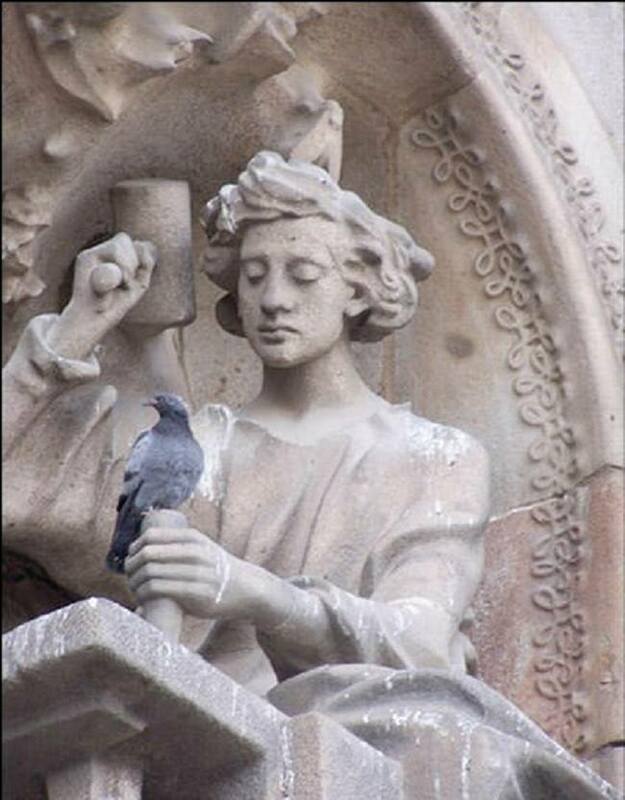 Too often, like the pigeon in the picture, our limited minds seem incapable of comprehending a bigger picture; sometimes they are unwilling to concede that there even is one. We will stubbornly insist that we have perfect answers to life’s most complex mysteries, and will defend incomplete perspectives with unwarranted zeal. The problem is one of binocular vision. The trouble with binoculars is that they allow you to see something small in greater detail, but they do not allow you to see what surrounds that thing, or what is between you and it. You don’t get to see the context of the thing. Not seeing context always results in a distorted and even problematic picture of reality, and distorted pictures always hurt us. Having a form of binocular vision, however, is unavoidable. We all filter the world through the paradigms of our upbringings, our formal education, our experiences, and so we learn to see certain parts of life with great clarity, but at the cost of blindness to other parts of the picture. This is compounded by our tendency to believe that the precision with which we are able to view one small, distant object is applicable to the whole worldscape. It is why some academics who are brilliant in one field often assume they have the right to have their opinions in disciplines not their own taken seriously (Richard Dawkins’ comments on the historical Jesus come to mind). It is why when we are hurt, and see human nature and the harshness of life more distinctly, we find it easy to become jaded and cynical. Pain, like success, simultaneously provides clarity and distortion. If the pigeon in the picture is like every other urbanised pigeon I have encountered, it is focused with an almost pathological single-mindedness on food. It is guaranteed to notice anything that a careless or beneficent human might drop. Despite its carefree appearance, this pigeon is training every muscle to respond with astonishing alacrity to mealtime opportunities, and whatever passes for mental activity in its brain is rehearsing battle strategies for fighting off competitors. But such extraordinary concentration comes at a cost. This pigeon has made itself infinitely more vulnerable to cats, hawks and – it would appear – hammers. So here you have, neatly summed up in one humorous pictoral parable, the dilemma facing all people everywhere: the more you focus, the less you see. We cannot escape it. I don’t know that we should try to escape it. But we do need to be aware of it. It is a universal law with potentially damaging ramifications. So what do we do about it? We make sure that we make a conscious and deliberate effort to seek out those whose perspectives on life we find disagreeable. Those opinions with which we resonate usually simply echo our own, and are prone to having the same blindspots. Those whose thoughts make us uncomfortable or whose opinions challenge ours are usually focusing their binoculars on other useful parts of the scene that we are missing entirely. They can enrich us immeasurably. Another pigeon somewhere sees that hammer. He probably only sees the hammer, and in frightening detail, and so lives in perpetual fear. We would both benefit from the other’s perspective. We are both diminished by the other’s absence. Having spent a significant amount of my life saturated with Calvinistic theology (much of which I still like, by the way – please do not read my recent criticisms of it as a wholesale dismissal), I have found it enormously enlightening to read what Easter Orthodox, Roman Catholic and even atheistic or agnostic writers have had to say about the cross. I have come to see how a picture of the cross that focuses on wrath and not on restoration damages people. I am certain that my picture was distorted for too long. I also know I would not have seen that if I had only consulted like-minded Christians. Some may be critical of the approach of deliberately courting the opinions of one’s detractors, but I think it makes for a stronger faith. If my ideas about Jesus and God are intellectually sound enough, they will stand. Anyway, I am not looking for a reason to believe or not to believe. I made that journey a long time ago. I have read the evidence from the top scholars on the veracity of the gospel claims about the life of Jesus, whether Christian or not. I am convinced on that count. I have read innumerable philosophical explanations for and against the existence of God. This is not about that. I am sure about Jesus. I am not quite so sure about my picture of him. This part of the journey is about closely scrutinising the picture of God I have constructed and which has been constructed for me, and reshaping it where necessary. I hope that in the process I have the intellectual integrity to dismiss what is illogical or incompatible with the historical evidence, rather than dismissing what I merely don’t like. So thank you, St John, for the inspirational picture. And remember, all my fellow pigeons: it is a fundamental rule of the road for drivers, with application on life’s narrow road too: don’t forget to check your blindspots.